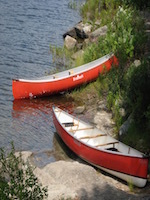 Canadian Canoe Routes • View topic - It Pays to be a Kijiji Hound! Post subject: It Pays to be a Kijiji Hound! So at 7:30 this morning when I signed on to kijiji for my early listings scour, I noted an ad that had only been up a couple hours. It was an awesome deal, so I immediately let the seller know I could be there for 9:30 as he lived only 5 minutes from my office. ... sitting outside on the roof of my Jeep is a made in Guelph, 16' UL kevlar Bluewater Saugeen. Factory paint over skin coat (no gel coat) that the seller suggested weighs 37lbs. After hoisting it I have no reason to believe otherwise (though I will weigh it when I get home) as it makes my 44lb S.R. Q17 feel heavy. It does need 30" of opposing starboard side wooden inwale and outwale spliced in, all the wood varnished, and a proper carrying yoke installed, but hey, for $200, how can you go wrong!!! Post subject: Re: It Pays to be a Kijiji Hound! So, she weighed in at 44.5lbs, not sub-40, but still a lightweight.